Based on "Mapper.xml", written by the man at http://naikrovek.org. Get a quick, fullscreen preview of your map in your favorite SVG editor. Regardless of your state of completion, the map will always be automagically scaled and centered to fit in the center of the viewable page. "/em color <colorname>" sets the current and all subsequent lines colors. "/em color" resets the color of the current and subsequent lines to black. Zonerect info and Min/Max elevations are automatically put on the bottom of your document. - Lines are "Paths" not "Polylines"
Rather than creating SVG polylines, Mapper2 uses DVG Paths. This allows for one click editing in Inkscape, rather than converting to an object and then editing. Use /em group to start a new group. All lines between "groups" will be grouped together. Very handy for doing multiple level maps in a single logfile. Lines will be grouped based on the AVERAGE height of the whole line segment. Lines will not be split, so "start new line" early and often. perl mapper2.exe <input_logfile.txt> <output_filename.svg> [Elevation] [Elevation] . . . If you use the grouping based on elevation, all /em group tags will be ignored. - Crosshairs for ease of Zone Rect Creation. The Crosshairs coordinates are listed at the bottom of the page as "UL: x,y LR: x,y"
These coords can be plugged directly into the ZoneRect calculator along with their corasponding bitmap coords. - Stand Alone EXE, no Perl Install Needed. Perl510.dll must be in install directory. - '/em group' command replaced by '/em mapgroup'. 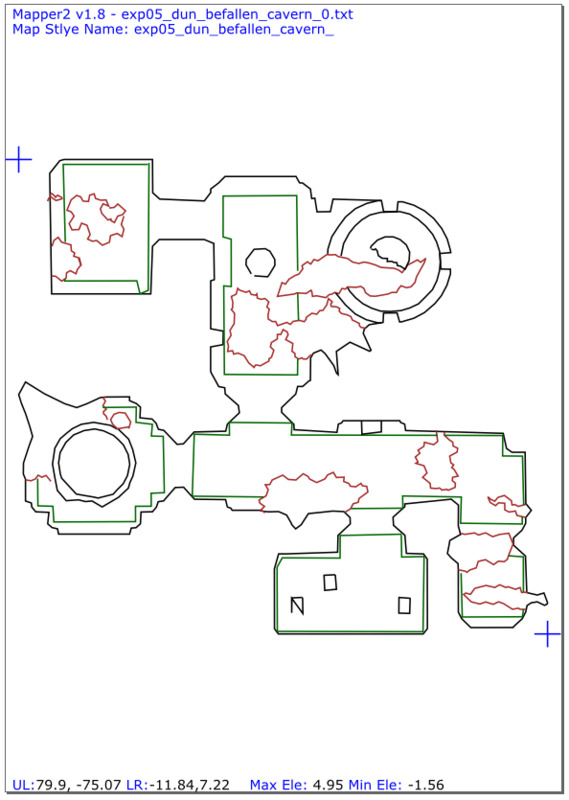 Mapgroups now properly split into layers, not just groups in Inkscape. 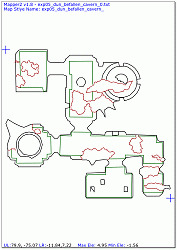 Great for creating maps in multi-level areas. Mapper2 was tested and developed for InkScape v0.46 SVG Editor. Well you certainly have been busy! Looks cool Peter.